Unleash your creativity with the Xenvo SquidGrip Tripod - The ultimate flexible smartphone tripod. Crafted with textured neo-rubber legs for superior gripping power so you can mount and secure your phone to just about anything. The SquidGrip Tripod is incredibly strong yet lightweight and compact making it the perfect companion for capturing photos and videos. Take the SquidGrip with you on your next adventure or use in right in your own backyard. The SquidGrip Tripod allows for infinite variety when positioning your phone for unique camera angles so you can capture impossible shots with ease. ✔ SUPERIOR FLEXIBLE NEO-RUBBER LEGS - Secure and mount your phone in any position imaginable. Wrap the textured gripping neo-rubber legs around a lamp, chair, tree or any object with rock-solid holding power to adjust your camera angle for the perfect shot every time! ✔ PORTABLE AND DURABLE DESIGN - Take the SquidGrip smartphone tripod anywhere you go. You'll be amazed at the lightweight and compact design that packs a punch with unshakable strength and stability. The perfect companion for smartphones and GoPro action cams. No other flexible phone tripod can match the SquidGrip's unparalleled strength. ✔ UNIVERSAL COMPATABILITY - The included SuperGrip phone mount adjusts to hold ANY size cell phone. 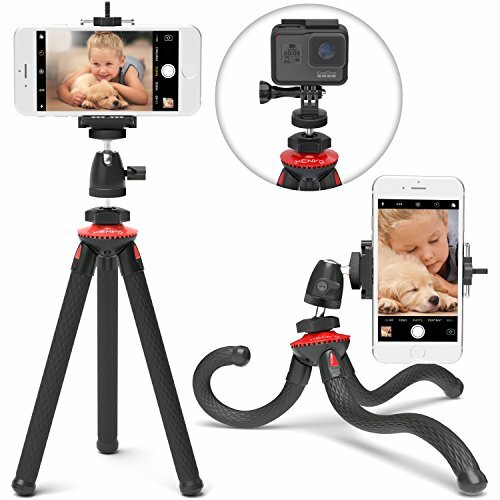 Get the ultimate mobile phone tripod for iPhone X, 8, 8 Plus, 7, 7 Plus, 6, 6 Plus, 5, 4, Samsung Galaxy S9, S9 Plus, S8, S8 Plus, S7, S7 Edge, S6, S6 Edge, ALL Samsung Note models or any other smartphone. ✔ INFINITELY ADJUSTABLE - The included Ball Head 360 allows for endless possibilities when positioning your phone. Capture photo or video from any camera angle. The all metal construction ball-head even allows for 90 degree bird's eye shots so you can angle your phone perpendicular to the floor. Great for product and food photography or anywhere your imagination takes you. ✔ LIFETIME WARRANTY - If your SquidGrip professional heavy duty tripod breaks or fails, or you're not 100% happy, we'll replace it or refund it, no questions asked. If you have any questions about this product by Xenvo, contact us by completing and submitting the form below. If you are looking for a specif part number, please include it with your message.